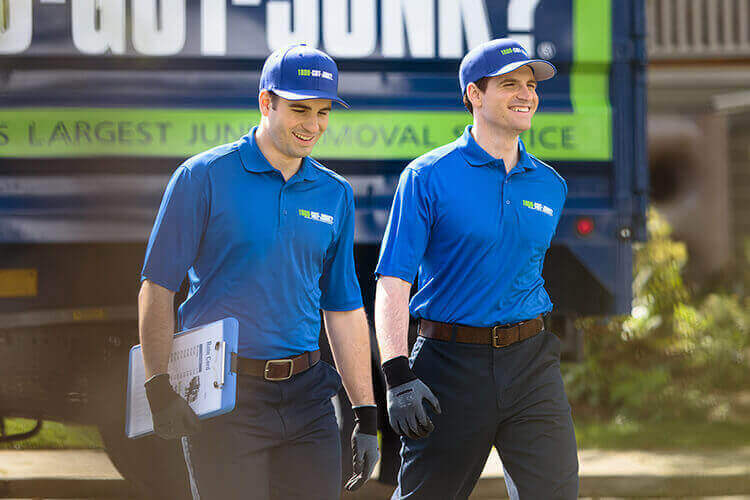 Tyre Removal & Recycling | 1800-GOT-JUNK? When it’s time to get new tyres, you usually don’t replace just one. That means you almost never have just a single old tyre that’s taking up space. You could make a tyre swing, but that only takes care of one tyre. So what are you supposed to do with the rest? Most people just stuff them into a corner of a garage, or just leave them sitting by the trash bins in the hopes that the local garbage collector take them. In most situations, they're not accepted in your regular waste service, which means they won’t even make it out of your yard. Don't let those old tyres get in your way or become an environmental hazard! 1800-GOT-JUNK? will never let those Tyres go to a landfill. Instead, we recycle them; Here's how you can get started! 1. Simply schedule your Tyre removal appointment online or by calling 1-800-468-5865. No matter where you live, tyres don't go to the dump. If you’ve got used tyres to get rid of, 1800-GOT-JUNK? can help you with tyre recycling. We pick up all kinds of tyres from cars, bikes, trucks, and construction equipment. Call us today! Can tyres be thrown in the dumpster? Proper tyre disposal can be difficult, which means that many landfills do not accept them. This means that tyres cannot simply be thrown in the dumpster. If they do end up in the landfill, they can possibly cause damage to the environment. If you’re going to dispose of your tyres on your own, you’ll need to check with your local recycling facility to see if they accept them. If you aren’t sure how to get rid of your old tyres, or just don’t want to handle it on your own, let 1800-GOT-JUNK? take care of it for you. We’ll remove your tyres from wherever they’re located, load them into our truck, and then make sure they get taken to the proper place for recycling or disposal. How can I properly dispose of Tyres? With so many people driving cars, motorcycles, and bikes these days, tyres are one of the most consumed items in the world right now. With so many old tyres out in the world, they can cause a variety of issues to the environment including adding exponential space to landfills. The proper way to dispose of tyres is to have them recycled. This can be complicated, since not all recycling facilities are able to accept tyres. Fortunately, there are services in place to get rid of your old tyres, so you don’t have to. 1800-GOT-JUNK? will take your old tyres from you and make sure they get to the right recycling facility so they don’t end up in the landfill. Can scrap car tyres be recycled? Tyres are made of synthetic and non synthetic rubber, wires and fabric. These substances don’t decompose on their own, so it’s important that they be recycled. Recycled tyres can be reused and recycled into flooring, mats, turf fields, playground surfacing, and athletic tracks.